we can offer you our top suggestions for where to go and what to do in the area. The town of St Malo” which fires everyone’s imagination with its charm and authenticity, its salty air, high tides, ship-owners and explorers. Here, you will discover a fortified town, taking strolls on the ramparts, as well as the magnificent panoramas of the bay, the islands, the long beaches and the breakwaters that are the iconic views of the town. Major cultural events take place throughout the year: the Rum Route (next edition 2018), the Rock Route, the International Festival of World Music and Dance, the book salons such as Etonnants Voyageurs, and the comic strips at the Quai des Bulles festival. The various strolls and walking routes that follow the classified buildings; Rue de l’Orme with its food shops; the few Malouinières (houses of ship owners in St Malo, such as La Ville Bague, where you’ll love the collection of Nerval’s tooth canes and the classified tapestries); the Grand Aquarium; and boat trips to take in the view of St Malo from the coast. A charming fishing port that hums with the coming and going of oyster farmers as they go to work on to their oyster parks. Port de La Houle is a lively spot from morning till night with its restaurants and open terraces. Reputed for its flat and hollow oysters, it is traditional to buy these at the oyster market (the only one in France) and then to go straight to the port to taste them. 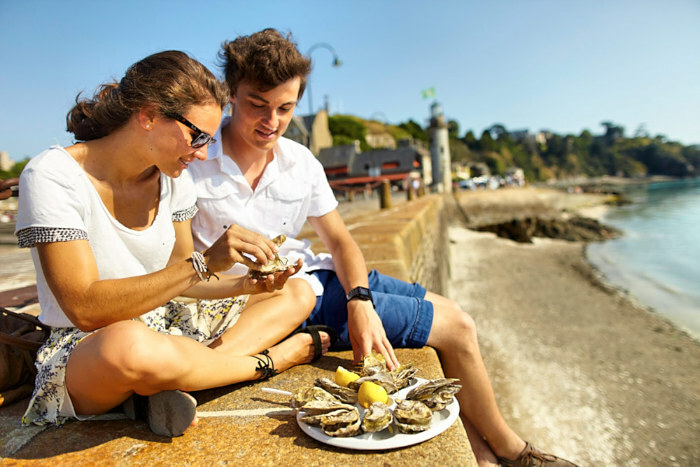 Cancale is also known for its AOC mussels, and its coastal paths that head towards La Pointe du Grouin opposite Landes Island, an ornithological reserve that is home to a large colony of crested cormorants, pied oystercatchers and common shelducks. Discovering the journey of spices at Roellinger in rue Duguesclin, tasting the millefeuilles at Grain de Vanille, buying a few oysters at the market and savouring them in front of the oyster parks, and walking along the coastal paths at Port Mer. 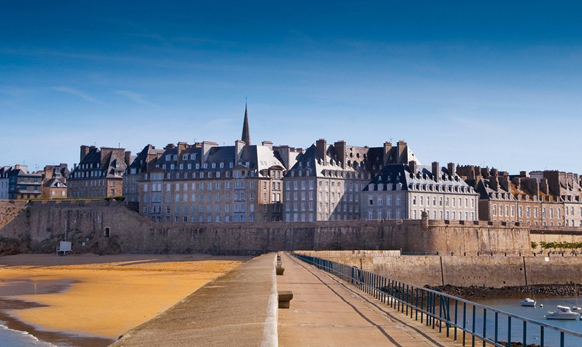 Approved as a city of art and history, this seaside town situated a few kilometres from St Malo can make a good trip from the hotel – a walk, and then a ferry from the Dinan landing stage (Cale de Dinan). Beautiful beaches decorated with blue cabins with blue and white stripes, a moonlit walk on the promenade decorated with exotic plants and luxurious villas set into the cliff. The Saturday morning market and the central covered markets, the Anglican church of Saint Bartholomew, located on Avenue Georges Clémenceau – don’t hesitate to push open the door and discover the place’s unique atmosphere – visit some of the twenty-odd art galleries or do some shopping, or have a reflexology session with Florence Martin on Rue de la Paix. 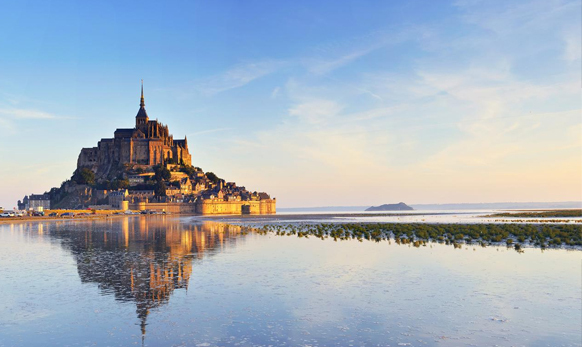 A “Wonder of the West”, Mont St Michel stands at the centre of a huge bay that is rocked by the biggest tides in Europe. At Les Charmettes, we love to take the panoramic route that goes from Cancale all along the bay, and to get that feeling where time stands still. You will cross the bay barefoot from Mont St Michel or at Le Vivier-Sur-Mer and find yourself in a silver desert with the elements, the sky and the earth, or in the traditional fisheries. Going back to explore this mysterious, majestic abbey during night-time walks in the summer : a light show that is often musical too, a magical moment and another way to appreciate Mont St Michel. Torch-lit walks around the mount.